Elizabeth Rynecki. Used with permission. One of the reasons I love Twitter is that you can meet people you would never otherwise know in your day to day life. I also love reading about researchers and their projects. One of my Twitter friends is Elizabeth Rynecki. Elizabeth is engaged in a fascinating project involving her great-grandfather's paintings. I wanted to share her research project with my readers and the opportunity to help her via a Kickstarter campaign. Gena: Chasing Portraits is the story of your great-grandfather and his art. Can you tell us a little bit about him and his life? Elizabeth: My great-grandfather started out life as the son of a tailor in Siedlce, a small town east of Warsaw. He was a student, and while he loved to draw and paint, he did not receive much mentoring or encouragement. His father made sure he finished both his Jewish education at a Yeshiva, as well as a more traditional education at a Russian middle school. Eventually Moshe was allowed to attend the Warsaw Academy of Art, but only for a short time period; his father just didn't see how his son could make a living painting pictures. To discourage his son from pursuing an art career, he married him off to Perla Mittelsbach, a woman from a family of some means. Together they operated an art supply store selling paint supplies, writing materials and books for artists and students. Perla 1929 by Moshe Rynecki, Used with permission. Moshe, for his part, never wanted to give up painting and, considering his culture and the times he lived in, he was very fortunate to be able to continue to paint. 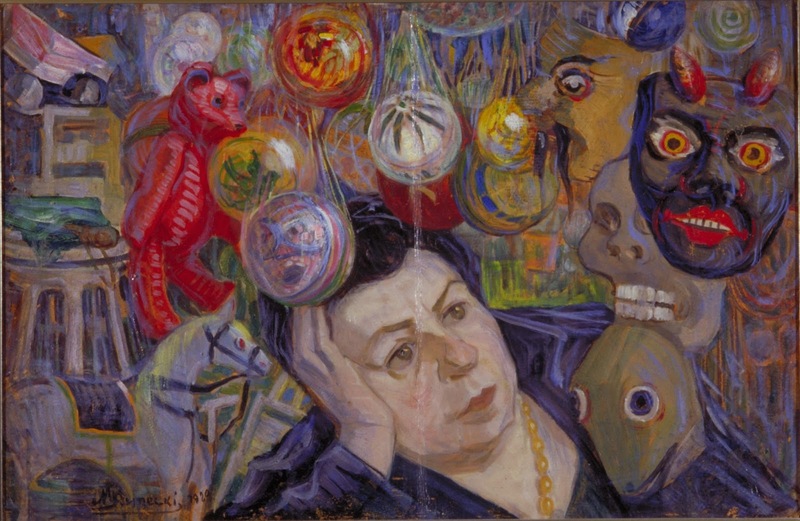 Perla supported, or at least accepted, the fact that her husband was primarily interested in painting. And so while Perla tended to the store and its customers, Moshe took his keen eye, sketchbook and paints into the world to record what he saw. His paintings reveal a painter whose real skill was visual narration, with a keen eye for exploring and documenting the daily rhythm of life. He painted artisans and laborers, study and worship in the Synagogue and moments of leisure. He was modestly successful, exhibiting consistently in the 1920s and 1930s in Warsaw. His works were featured in Jewish art salons, the Jewish Society for the Promotion of Fine Arts and at the Warsaw Art Academy. 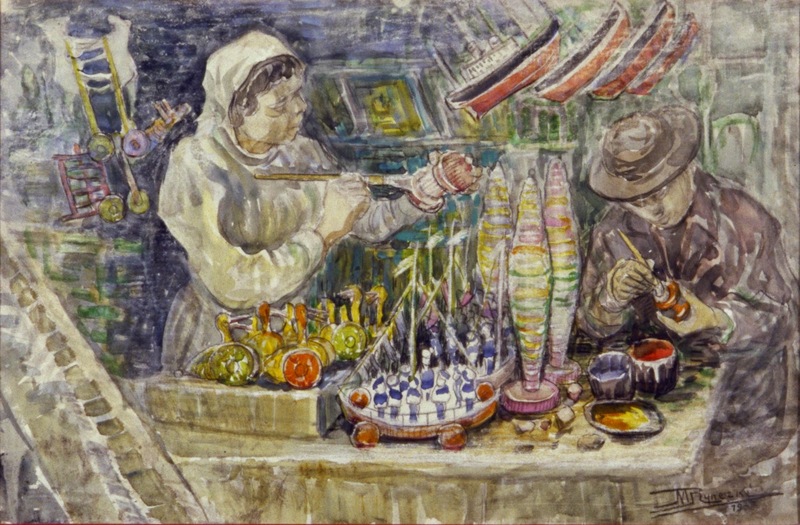 Toy Factory, 1937 by Moshe Rynecki. Used with permission. Moshe was also prolific: By my grandpa George's account, Moshe had produced roughly 800 paintings and some sculptures by 1939. In September, when the Nazis invaded, my great-grandfather became concerned that his life's work would be destroyed. In an effort to safeguard his art, he divided it into bundles and distributed the work to trusted friends in and around the city of Warsaw. He gave lists of the hiding places to his wife, son and daughter, hoping that eventually his oeuvre would once again be whole. Unfortunately, it was not to be. While his son George begged him to stay outside the Warsaw Ghetto and hide, Moshe willingly went into the Ghetto to "be with his people," and was eventually deported to Majdanek where he perished. My father and his parents miraculously survived the Second World War living in Warsaw with fake papers. They paid bribes, bought and sold goods on the black market and had their fair share of close calls. In fact, my grandpa George spent the last year of the war in a prison, and was being marched to a death camp when he was liberated by American soldiers. Moshe's wife, Perla, survived the war, as did a few cousins. But Moshe's daughter, as well as most of my father's family, did not. Although the war had left the vast majority of Warsaw in rubble, Perla returned with a cousin to search for the hidden bundles of art. Her husband, her store and the world she knew were all gone, but she hoped to be able to at least retrieve Moshe's legacy. 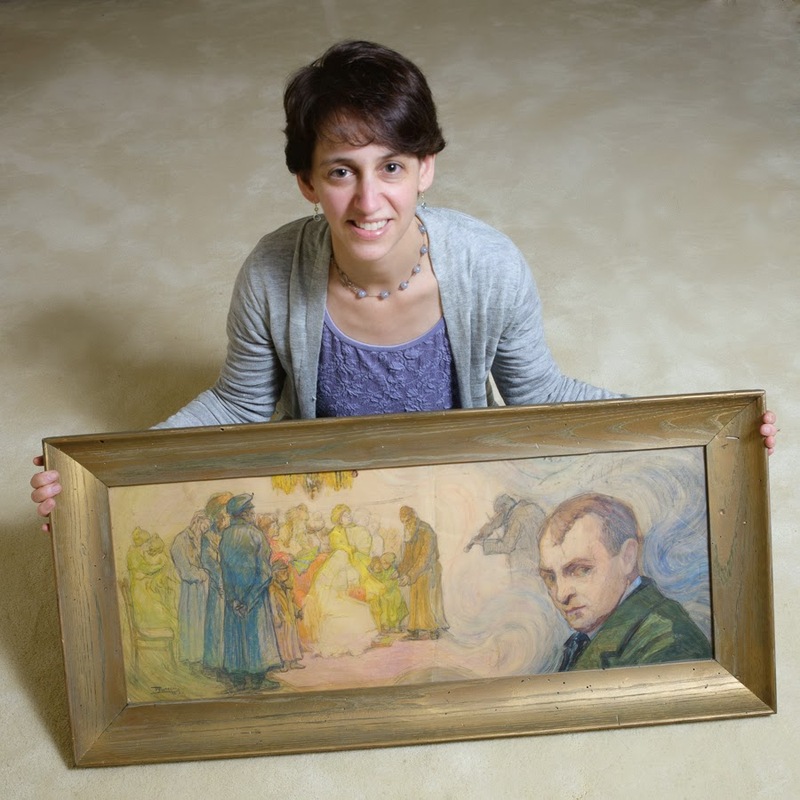 She believed the paintings would tell the story of a community that once thrived in Poland, acting as a testament to her husband's passion for art, to the Jewish people and culture, and a way of life that once flourished. Perla found only a single bundle in the basement of a home across the river Vistula, just over 100 pieces. Many were relatively pristine; others were ripped, torn and stepped upon. She bundled up the surviving works and took them to her son (my grandpa George) who, by that point, was living in Italy awaiting permission from the United States government to emigrate and start his life anew. 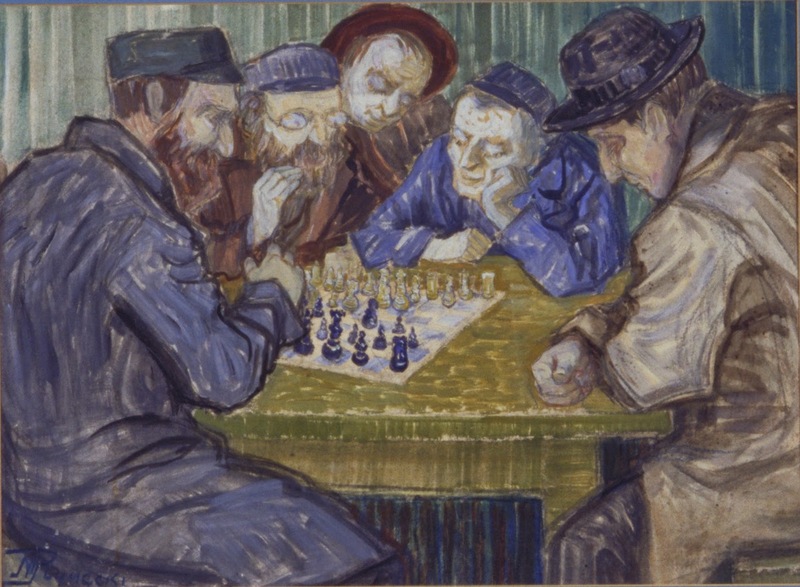 Chess Players by Moshe Rynecki. Used with permission. Gena: At what point did this quest to find his artwork become important to you? How long have you been searching for his paintings? Elizabeth: I grew up with my great-grandfather’s paintings on the walls of my parents’ and grandparents’ home. I’ve known his work since I was very little. I’ve been actively searching for his lost paintings since the late 90s. Gena: I’m amazed that you've found some of his paintings. Can you talk about how you have tracked down his art? What resources have you used? Gena: When I read about what you’re doing it seems to me it’s the ultimate family history project. You are telling the story of your great-grandfather’s life by finding, displaying, and honoring his work. What advice would you give to other family historians who want to tell the story of their ancestor’s life? Elizabeth: Passion, dedication, persistence, and perseverance. Gena: How can we help you make the film Chasing Portraits a reality? Elizabeth: Chasing Portraits has a new 3 minute trailer based on footage shot in Poland in October 2014. The trailer can be seen on Kickstarter, where I am raising funds to match the $20,000 grant from the Claims Conference to finish filming. In order to access the Claims Conference grant, I need to match it dollar for dollar. Kickstarter is a crowdsource funding platform, so all amounts really do help to make reaching the goal possible! All donations, less the value of the reward selected, are tax deductible because the docfilm has 501c3 status from the National Center for Jewish Film. See the film here on the Kickstarter website. Follow Elizabeth on Twitter at @erynecki .